Most of us usually use a pen for writing or doodling on paper but Portuguese professional lawyer Samuel Silva can do more than that. 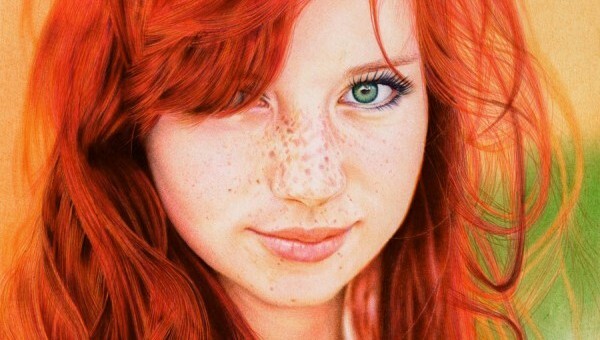 By just using a common set of Bic ballpoint pens, Samuel creates amazing realistic portraits for about 5 – 50 hours. Knowing that creating art is just a “hobby” for him makes his works truly unbelievable. His first ever work published in his portfolio called the “Redhead Girl” portrait became viral after it was shared over Reddit. The portrait which was based on a photograph of a Russian model was created for 30 long hours. Every detail of the face through every strands of her hair was captured by Samuel’s ballpoint pens. Samuel uses the grid technique in making his portraits as accurate as their references. Aside from a pencil for his preliminary sketching, he uses 8 colored Bic colored ballpoint pens (Yellow, orange, magenta, light green, light blue, blue, pink and purple) plus a classic blue and classic black Bic pens. Let’s take a closer look on more of his awesome works. Look closely for it may be hard to believe that the images below are actual drawings. Enjoy! Find out more of Samuel Silva’s awesome works on his DeviantArt gallery. Drop us your thoughts and suggestions by commenting below. Find You The Designer on Facebook, Twitter and Google Plus for more updates. Also, don’t forget to subscribe to our blog for everyday design news, freebies and awesomeness.